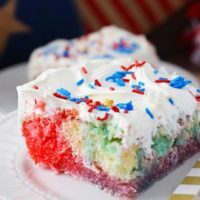 Red White and Blue Poke Cake is a classic jello poke cake made with patriotic colors perfect for celebrating summer, July 4th, and the USA! 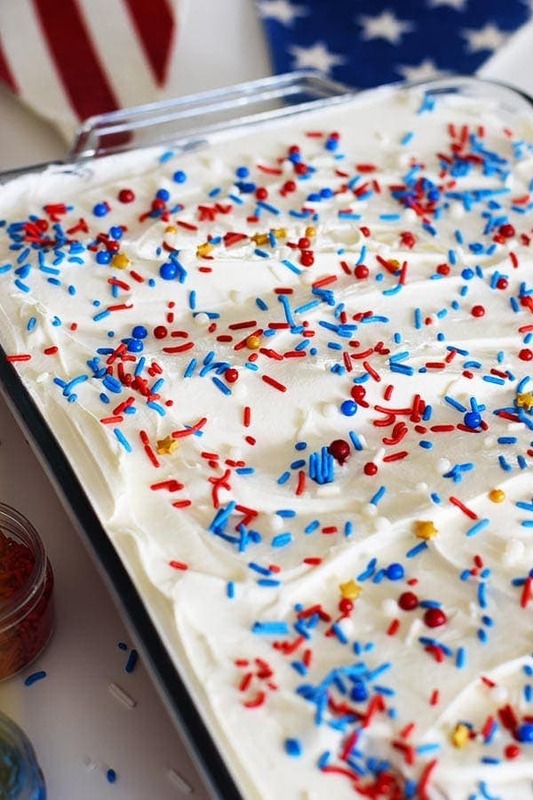 This cake is moist, delicious and covered with fluffy whipped topping and festive sprinkles and candy! Living in America is certainly something to celebrate. Over the summer we remember those we have lost to protect our freedoms in this great country, celebrate our independence as a free nation and honor hard working Americans. We go all out in Red, White, and Blue!! It’s a time spent with friends, family, and (at my house) almost always includes some delicious food. We Americans are all in for a time of celebration and gathering with the ones we love is so important. 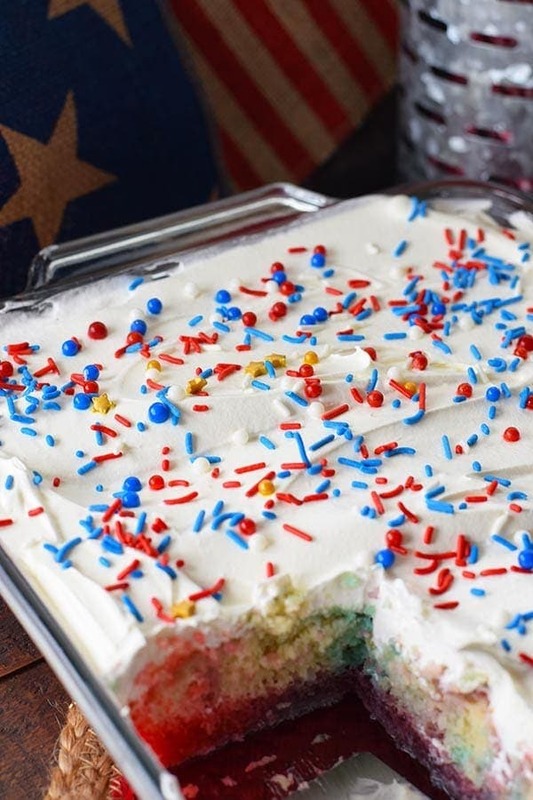 This patriotic cake is perfect for any Summer weekend get together. 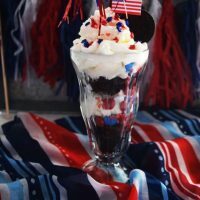 Here are a few suggestions that will pair perfectly with it – Honey Chipotle BBQ Wings, Grilled Summer Vegetable Pasta Salad, and then whatever else your guests or family will bring along to to share. Do you ever have potlucks at home? There are times I cook the entire meal when company comes over, but often we all pitch in. For some reason I get selected to make dessert sort. 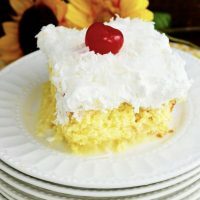 A few family favorites that are requested are my Easy Coconut Cream Pie, Mini Almond Cakes with with Blueberry Whipped Cream and my Oreo Brownie Poke Cake. What are your traditions for your summer celebrations? I would love to hear down in the comments or over on our Facebook Group! 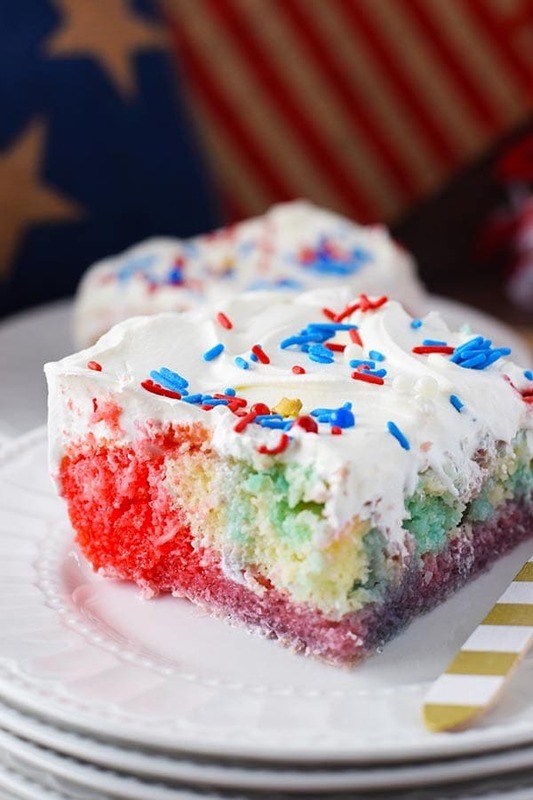 This cake is another easy recipe I hope you will enjoy sharing with your family and friends! Step 1. Prepare and bake white or french vanilla cake mix according to directions on box in a 9 X 13 baking dish. Let is cool completely. Poke holes in cake using a back of a wooden spoon (Anyone else notice you can hardly find ones that have a small round handle – dollar store usually has them though) or a straw. Step 3. 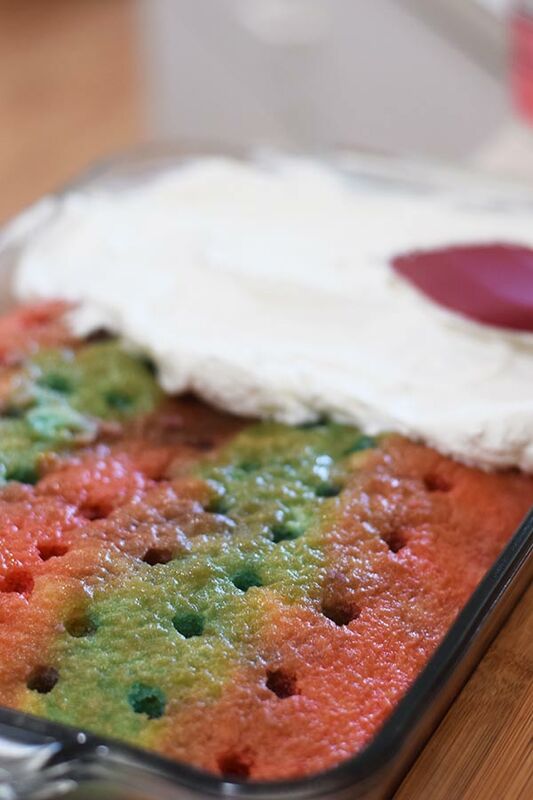 Cover and refrigerate the cake for 3 hours or over night until Jello is set. Step 4. 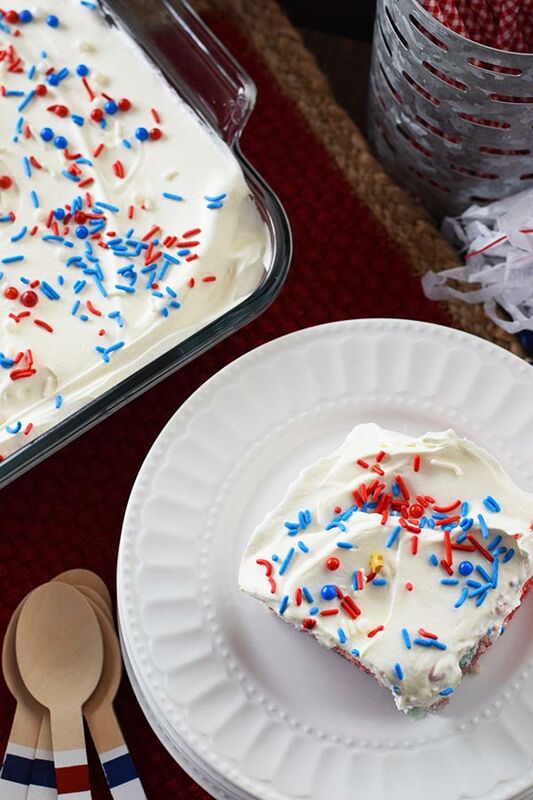 Cover the cake with whipped topping and your favorite red, white, and blue patriotic sprinkles and candies. Slice this cake and enjoy! 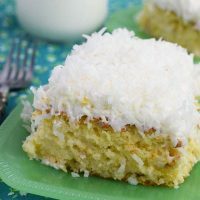 It is moist and light and oh so fluffy with that whipped topping! Y’all go ahead and dig in and enjoy this one! 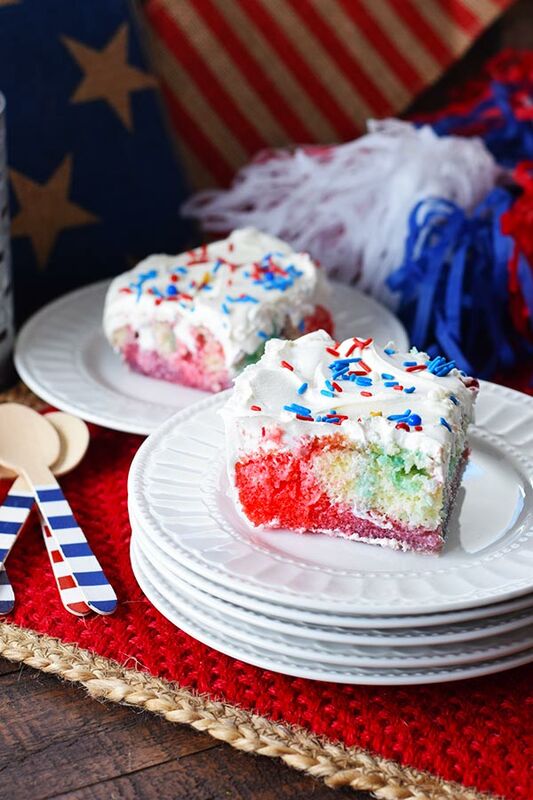 It’s the perfect dessert for your Patriotic Celebrations! TIP: Change up the colors to fit your occasion! Prepare and bake cake mix according to box instructions. Allow the cake to cool completely. Using the end of a wooden spoon or a straw poke holes in cake. Prepare each box (color) of Jello in a separate bowl or large measuring cup. To Red Jello add 1 cup of boiling water and stir until dissolved then add in 1/2 cup of cold water and mix completely. Repeat with Blue Jello. Carefully pour red Jello over the cake alternating in alternating rows over the cake. 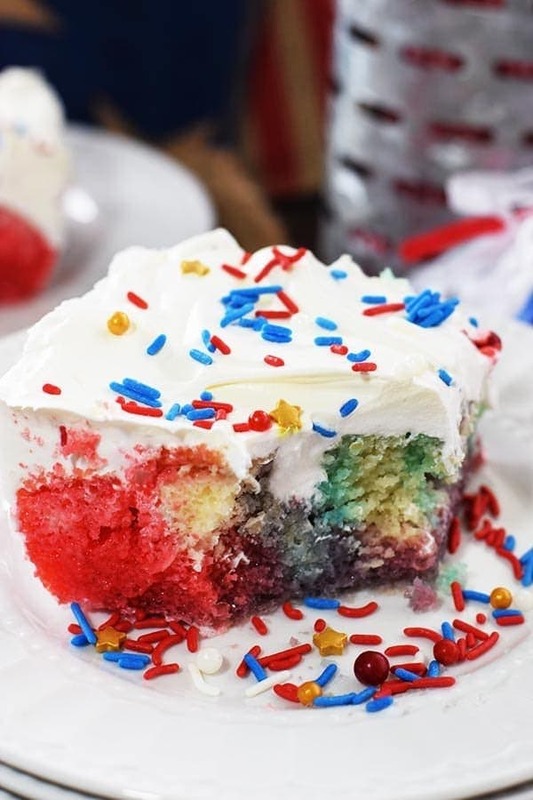 Make sure to get Jello into the holes of the cake. Repeat with blue Jello until entire cake is covered. Cover and refrigerate the cake for 3 hours or overnight for Jello to set up. 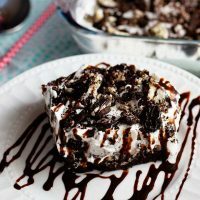 Remove cover and spoon whipped topping over entire cake. 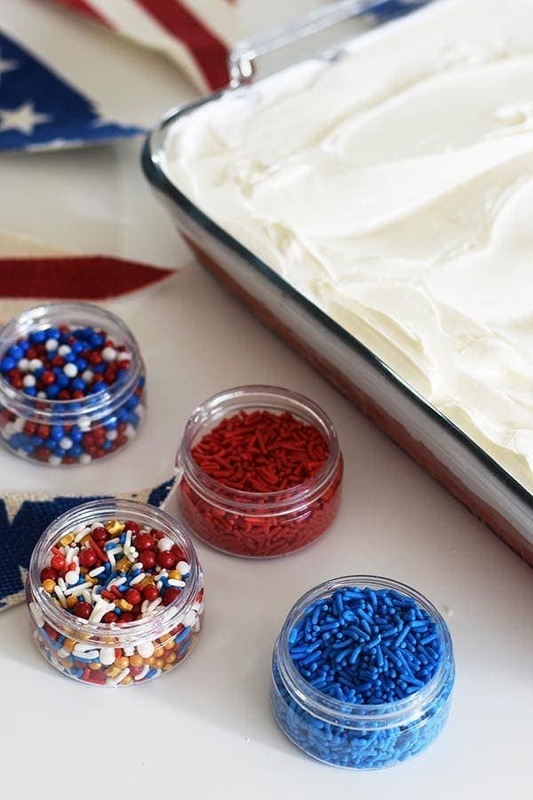 Decorate with Red, White, and Blue Sprinkles and Candies. You can also find this over at Weekend Potluck and Meal Plan Monday!